For the past two years, through the TETF.Index update, we have enjoyed connecting with many of you, sharing our thoughts on ETF industry growth with advisors, investors, and media. We want to thank all our readers and followers for your attention, feedback, and comments acknowledging the thoughtfulness of our research, data, and ideas. We have often connected the growth of the ETF industry to client alignment, which we categorize as four key attributes of the ETF structure: Transparency, Liquidity, Lower Cost, and Tax efficiency. As we seek to expand our research on ETF growth, we realized that these same client alignment factors are driving the growth of advisors. Advisors use ETFs to better serve their clients, and they are embracing ETFs and driving the growth of our industry. 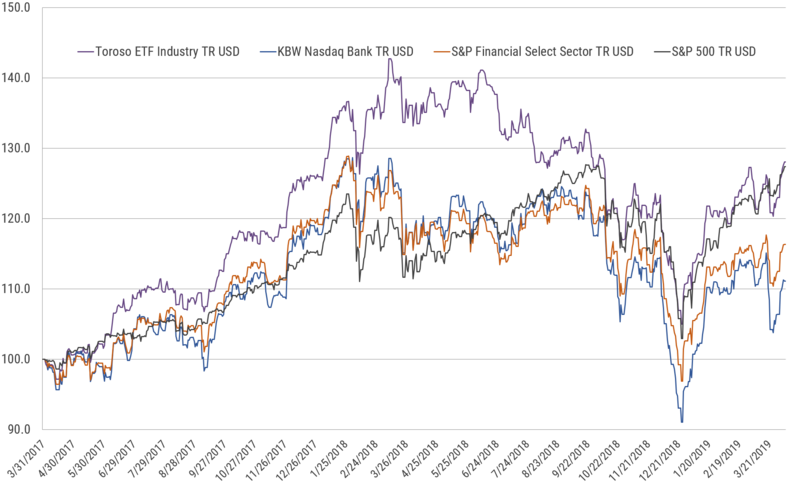 To that end, we are rebranding the TETF.index update to ETF Think Tank Weekly Research. Our research team will continue to share their points of view on the growth and benefits of the ETF ecosystem while adding more content we believe to be most beneficial to both advisors and investors at large. Additionally, we believe that we are building something great and will feature exclusive ETF Think Tank-related news to keep our readers up-to-date with what’s going on in the community. What is the ETF Think Tank? The ETF Think Tank is a community of advisors growing through client alignment. The tools, research, and content shared within this community are designed to promote client alignment and synergistic growth. We are super excited with the direction of our communications and are always eager to hear your feedback! Join the discussion at etfthinktank.com by becoming a member! As ETF Nerds, transparency is one of our favorite client alignment growth factors. This ETF attribute allows advisors to know exactly what they own at any given moment. As researchers, it provides real-time data for analysis and insight. However, data without context is meaningless and ETFs have grown faster than the common language or context required to understand and embrace their transparency. We began this discussion a few months ago when we questioned the confusion caused by the term “Smart Beta.” Essentially, within the ETF Think Tank, we sought to design a taxonomy or language for describing ETFs from an advisor perspective. This thought process is the basis for the Toroso ETF Security Master, which powers much of the research and ETF analysis tools available to the ETF Think Tank community. So, as advisors, we believe the most important thing to know about an ETF is what are the underlying holdings. Therefore, our security master begins with categories based on the asset class of the underlying holdings. From these initial categories, we can provide insights and baselines for all ETFs. Source: Toroso Investments Security Master, as of April 5, 2019. What Can ETF Transparency Teach Us? Each of our initial categories are designed by advisors for advisors. We seek to reconcile information from multiple ETF data sources to provide advisors with information on what they actually own rather than what the fund sponsors state are their objectives. As we look at these categories, it appears US ETF investors are allocated pretty aggressively. 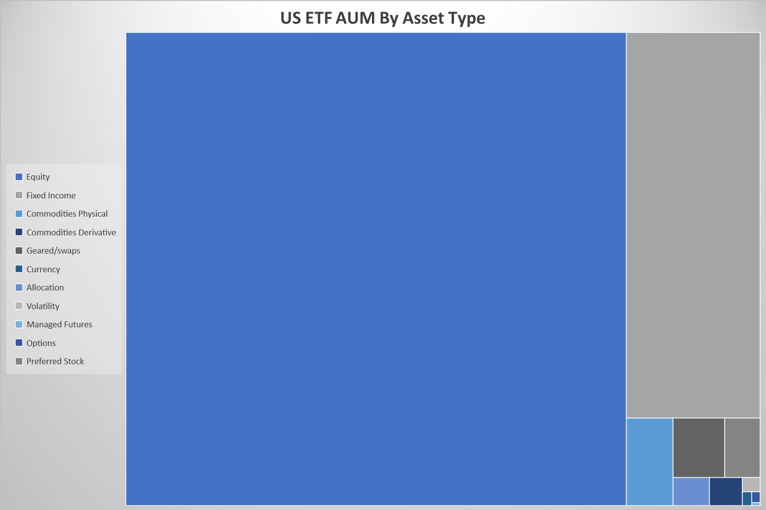 Almost 80% of all ETF assets are allocated to equities. Most advisors think of a 60/40 model as balanced, but ETF assets point more toward an aggressive 80/20 model. Our community also gets to have some fun, especially when it fosters engagement and education around ETFs and client alignment. A few weeks back, we started the ETF Ticker Madness bracket and polls to find this year’s champion. We conducted twitter polls for each round and asked our followers to vote on ticker fondness or marketability rather than investment merit. Now, we are down to the Final Four. 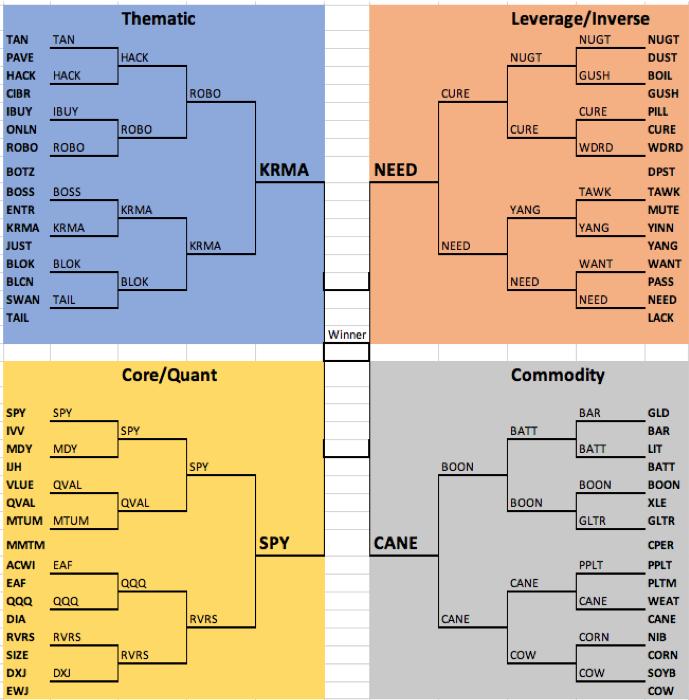 Will the winner be the $SPY dynasty or will $CANE find sweet victory? You can’t always get what you want, but will $NEED advance against good $KRMA? Source KPIs: Toroso Investments Security Master, as of April 5, 2019. Returns as of April 6, 2019. Inception Date: April 4, 2017. Index performance is for informational purposes only and does not represent the ETF. Indexes are unmanaged and one cannot invest directly in an index. Past performance is NOT indicative of future results, which can vary. As of April 6, 2019.